Learn how to Grow Bulbs! This is a course designed for the flowering bulb enthusiast or commercial bulb grower for the cut flower market. 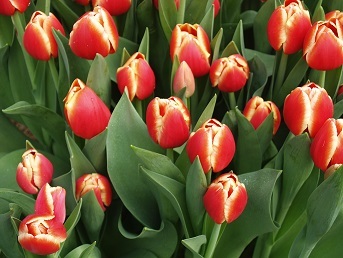 Develop your ability to select and cultivate appropriate varieties of bulbs as cut flowers (in different situations). Identify bulbs and the families they belong to and to determine their cultural needs. Form a sound understanding of the basis of horticultural practice: soil types, plant nutritional needs, treating and preventing pests, diseases and weeds. If you have always wanted to learn more about flowering bulbs and how to grow them commercially or at home, this is the place to start! In each lesson there are set tasks to complete based on practical skills and problem based learning. There is also an assignment to complete with each lesson. Bulbs come in many shapes and sizes, and from a huge variety of different climates. You can find species of bulbs to suit almost any climate and situation, from heat tolerant to shade loving species. The only thing most species have in common is that they resent growing on poorly drained soils – if you have soils such as this don’t despair as you can try using raised beds or growing your bulbs in pots. There are around 300 species and thousands of hybrids of these plants originating from across the Northern Hemisphere. They can have grey-green to deep glossy green sword-shaped leaves usually arranged like a fan. The flowers usually have three outer petals called 'falls' and three inner petals called 'standards'. Bearded irises have hairs on the falls. Given the complexity of this genera, Irises have been categorised in different ways. Botanists tend to classify them into various genera, subgenera, and sections. Gardeners often place them in two groups of bulbs and rhizomes. These groups may be divided further so the bulbs include Dutch and English Irises (Xiphium), Junos Irises (Juno), and Reticulata irises (Iridodictyum), and the rhizomes include Bearded Irises (Iris), Beardless Irises (Limniris and Xyridion), and Crested Irises (Crossiris). Most grow best in fertile, well-drained soil in full sun. The optimal soil pH is 4.5 7.5 and the ideal pH is around 6. Most do not tolerate lime. In hot climates they should be planted deeper. In wet situations plant them shallower or on mounds. Irises are generally heavier feeders than other bulbs and rhizomes. Most iris can be lifted and divided every two to three years, or more frequently if they become overcrowded. The bearded iris seems to be more susceptible to diseases than some of the other groups. Generally, rhizomatous species are prone to rust appearing as reddish brown lesions, leaf spot (usually caused by damp conditions), cucumber mosaic virus and arabis mosaic virus which cause chlorosis of the leaves and distorted growth, and rhizome rot which reduces rhizomes to slime. The bulbous irises are prone to iris mosaic virus which causes chlorosis and distorted or stunted growth, ink disease which results in black spots and lesions, grey bulb rot which is a fungus that hinders growth from the tip of the bulb, blue mould which is a fungus that destroys stored bulbs, leaf spot which causes foliage to decay, and iris scorch which causes leaves to redden and decay. Pests include narcissus fly larvae which attack the above ground parts of bulbs, aphids which are more of a problem with bulbs in storage, eelworms, slugs and snails which attack both bulbs and rhizomes, and some caterpillars which are partial to bearded irises. Landscapers use iris in woodland gardens, water gardens, meadows, rockeries, alpine gardens, as border plants and container plants. Farmers grow them for cut flowers. I. germanica (Purple Flag, London Flag) - easy to grow (ground root is "orris root" used in potpourri). A bearded iris to 60-90cm tall. These are evergreens with flowers to 12cm wide which are more scented than other types and have deep blue-purple falls with white beards and paler blue standards. I. sibirica - a beardless iris to 1m tall. These have narrow foliage, and blue flowers to 7cm wide with white stripes on the falls. There are many colourful hybrids. I. japonica - a crested iris to 60cm tall. These have glossy green leaves in a fan shape and bamboo-like stems. The spring flowers are lilac with dark spots and are 5cm wide and flat. I. laevigata - a beardless iris to 60cm tall. These deciduous irises grow in permanent water up to 15cm deep (ponds, etc.) and waterside locations. Summer flowers are borne on stems in groups of three to 15cm wide. The flowers are dark blue with a white stripe on the falls. I. orientalis - these have wider leaves than I. siberica, and grow to 1.2m tall or more. They have white to cream flowers with a yellow central band. Other colourful varieties have been developed. I. reticulata - a bulbous iris to 15cm tall. These are easy to grow. Each bulb produces four ribbed leaves. They produce dark blue-purple flowers in late winter to early spring.